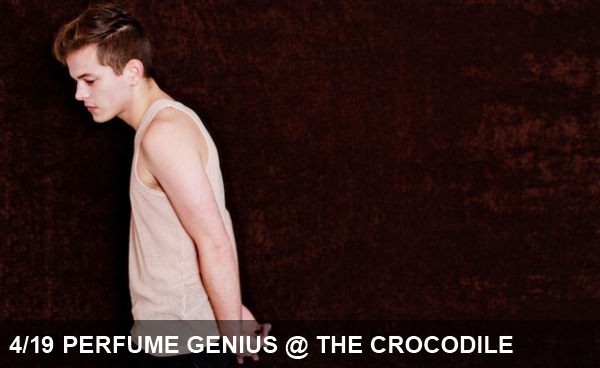 After the release of Perfume Genius‘ debut album, Learning, in 2010, Seattle-native Mike Hadreas catapulted to critical acclaim for his piano-driven, minimalist masterpieces dealing with drugs, suicide and fractured love. We’ve struggled to come up with apt descriptions of his sound when friends have asked, but the best we’ve been able to muster involves some combination of the beautifully sad parts of Grandaddy and the hauntingly intimate voice of Sufjan Stevens. Like all descriptions of true artists, that predictably falls hopelessly flat as Hadreas’ sparse arrangements and deeply personal subject matter climb to a level of delicate beauty that hardly seems possible from weighing the sum of the parts alone. Whether you’ve been a fan of Hadreas since Learning, have since learned of Perfume Genius after the release of his sophomore album Put Your Back N 2 It, or are just hearing about him for the first time, we highly recommend spending some time with his music in a quiet room. For the live experience, head over to the Croc Thursday night for a performance we’ve heard will be sure to keep the occasionally rowdy Seattle crowds quiet with rapt attention.